As moms we are constantly toting little baggies of snacks. Be it crackers, grapes, cheerios or carrot sticks for little fingers. Even in pregnancy I had a multitude of snacks with me at any given time. I couldn’t leave the house without a baggie of almonds. 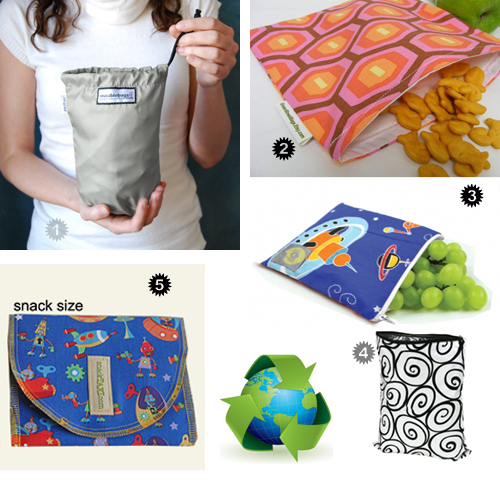 So why not ditch the plastic and carry the snacks in a reusable snack baggie? Below are 5 funky options to stave off hunger while reducing the number of plastic baggies being thrown out. The features all have in common are that they are fabric made, generally with a waterproof or resistant layer, are washable and reusable. Skip the plastic baggies next time your at the store, and stock up on a few reusable bags instead. Be green in your snacking!